Today Dorney Park and Wildwater Kingdom announced their plans to add a new type of season pass, along with a new high-capacity restaurant in Wildwater Kingdom for the park's 2018 season. Known as the Pre-K Pass, the park will offer a brand new season pass to children between the ages of three and five at no cost, yes, free! Guardians must register their child online through the park's website, and as a bonus the 2018 pass will be valid for the remainder of the 2017 season. Dorney Park will also build a brand new, high-capacity modern dining facility within Wildwater Kingdom in 2018. Known as Tidal Wave Cafe, the eatery will be based off of successful designs already implemented at other Cedar Fair parks in recent years, and also contain a Coca Cola Refresh station as well. The building's design, seen above, is meant to allow a large number of guests to select their food from a cafeteria-style setting before paying and exiting. Tidal Wave Cafe will feature dishes that are a part of the park's meal plans, which is quickly growing in popularity with park guests. Menu items include hand-battered fried shrimp and chicken tenders, along with rotisserie chicken, delicious macaroni and cheese, and house-smoke pulled pork cooked in a brand new smoker. 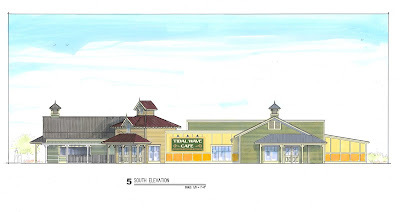 Tidal Wave Cafe is part of a multi-million dollar renovation of one part of Wildwater Kingdom. In order for the modern and aesthetically appealing building to go up, two older food locations will be removed. They are within the pink box in the aerial image above, and are Mariner's Munchies and the Rita's Italian Ice stand to the left of it. 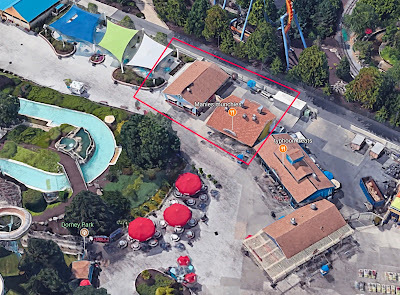 Tidal Wave Cafe will also feature an expanded outdoor dining area where the red umbrellas are above - a portion of the berm next to the lazy river will be removed in order to expand seating. The covered seating area in the upper left of the aerial, added in the water park's last major renovation, will also be slightly modified to accommodate both the new restaurant and seating areas.